It is well-known that the rivalry between the University of Notre Dame and Michigan State University began on the football field. I’m not sure how the Spartans expected to assert dominance over a football program whose players adorn helmets painted with real gold (from the Golden Dome), has the oldest and most renowned college marching band in history, and whose stadium is overlooked by a mural of Jesus raising his arms in successful touchdown fashion—but everyone makes mistakes. Needless to say, while football started the rivalry between ND and MSU, the Irish have already won that battle and continue to outshine Michigan for a number of other reasons. 1. ND doubles as Hogwarts. 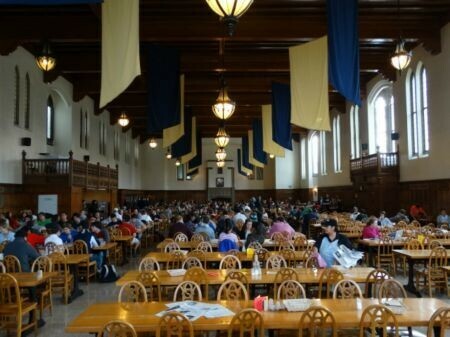 ND’s South Dining Hall is truthfully rumored to have inspired the Great Hall in Hogwarts. The resemblance is scarily wonderful. By definition, Michigan State’s dining facilities will never compare. They do not have a painting of an elderly, bearded, wizard-esque man everyone loving calls Dumbledore and long, magical wooden tables fit for Harry and friends. Notre Dame is the closest you can get to living out your fantasy of attending ye ol’ famous school of Witchcraft and Wizardry. 2. Our red-heads are better than theirs. What other school in the history of forever has so much spirit they require a fifth-string leprechaun for sporting events? Yes, I said those five magical syllables your hidden Irish heritage has been waiting to hear: FIFTH-STRING LEPRECHAUN. This means there are four men ready to step in if the leprechaun you see on TV gets hurt. I might as well stop there. If that isn’t a selling point in itself, I don’t know what else to write about. Just kidding. Of course I do. 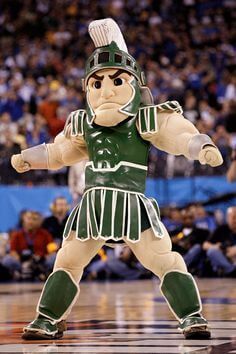 But seriously, one look at the Spartan mascot has me reciting Chris Farley’s “fat man in a little suit” line from Tommy Boy. Your muscles are Styrofoam and your skirt is too short, Spartan. Please go put on some pants while our real-life leprechaun tops the cheerleader’s pyramid. 3. You never have to learn anyone’s names. I’m only semi-kidding. At least half of the girls in your class will be named Mary, Sarah, Elizabeth… Just keep going down a list of Biblical names until you’ve hit the right one. The boys are slightly trickier—they will follow suit and have Biblical names (John, Mark, Luke, etc) or they will be named Pat. At college you will meet people and be expected to learn names at an impossible rate, but at ND this will not be an issue! With 38,000 undergraduate students at MSU, however, you might have trouble finding any sort of name system to help you navigate those social waters. Hesburgh Library is “Club Hes” (open 24/7! 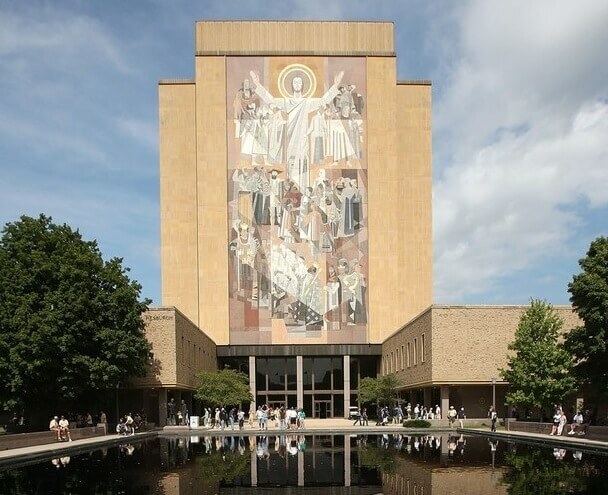 ), Touchdown Jesus is.. well, Touchdown Jesus (fun fact: only 15 percent of the student body knows the actual name of that mural. Second fun fact: I made up the first fun fact but I’m pretty sure it’s accurate. ), and even the Rockne student gym is known as “the Rock.” Cutting off one syllable? Now that is a student body that dares to be effish. I mean, efficient. Why all of the abbreviating, one might ask? Because we can. With incoming ND freshman averaging a composite score of 33 on the ACT and Michigan freshman averaging a 26, I’d say Irish intelligence is the culprit of our amusing ingenuity. PayScale’s College Salary Report ranked Irish alumni 24th for starting salaries nationwide. Michigan was close behind… oh wait… no, they weren’t. But they were on the list at #320! Notre Dame also has the largest and most active alumni network in the world, which is a huge help to all Irish students. With 270 groups worldwide, some may call it cult-like. Those people are probably also from Michigan and looking for a job.